Your kitchen is one of the most important areas in your home, it is where you create and store food items, it is where you clean and store dishes. If you don’t have order in your kitchen it can make your whole home and your whole family feel disorganized, resulting in a negative effect on how you feel and how motivated you are to tackle the problem. It isn’t difficult to create order in the kitchen, but it does take will power and determination to continue on the journey and not to slip back into old habits. If you have order in just one area of your home it is then easier to slowly take control of other areas too. Sometimes a tidy kitchen can make a home feel cleaner without doing anything more. However, you might need to ensure that you have rules in place for the rest of your family, if they are old enough to get their own food then they are old enough to put away the items they have used and put the used items in the dishwasher or to wash them up. There are chores that need doing in the kitchen every day and if you put these into routines that you do automatically, then your kitchen will look cleaner all the time. If I am washing up, I don’t have a dishwasher, then I wipe down all the counters, lifting up the few items that I have out to make sure nothing has got caught underneath. I clean my hob every evening, even just a quick wipe down, even if I haven’t used it. I wash up as I use things, this way it keeps the kitchen looking tidy even when people are in the kitchen. I always have a bowl of hot water when I start any task in the kitchen, it then makes it easier to ensure the washing up is as easy as possible. I have dogs and they shed their fur so I have to make a point of sweeping my kitchen daily too. I wash the floor weekly, sometimes it is more often, but that depends if something has spilt on the floor. While I constantly wipe the fridge out daily if I see something, I do clean it once a week, this allows me to keep a check on what food needs using up. Again, if I see a mark on a kitchen cupboard I will clean it immediately, however, I do wipe down all handles and cupboard doors weekly. It is a white kitchen and can look grubby quickly. I wipe down the tiles if I see a mark daily, but I do a good clean of them once a week. I wipe down my light fittings, these bug me the most and I would like to do them more but for now, I am OK with once a month. I wash my window in the kitchen at least once a month, again, this area bugs me, I hate seeing dirty windows but it is a pain to clean as I have to climb onto the work top! I pull out my large appliances about once a month and clean the top and the floor underneath, this is the worst job for me out of them all, and one of my least favourite jobs and I think it is because of the amount of dirt that can accumulate in such a small space in time. These routines which I have in place ensures that when I walk into the kitchen it is clean and reasonably tidy and this means that I don’t get annoyed, as I would if I walked in to find a pile of washing up waiting for me. If you start to take control of one room in your home it is then easier to build other rooms into your routines, it is no good trying to remember what you need to do and when, planning is the key to getting all your tasks completed. There are times when things don’t go to plan, don’t panic; it is easy to get back on track, if an old routine doesn’t work then change it until you find a routine that does work for you and your family. Therefore, if you start by creating order in the kitchen then it makes you feel good and it can help to kick-start the routines in the rest of your home. Sounds good. But I know me, I won’t move my appliances, or wash the windows. I do hope to get a cleaning routine going here at my new home. So far, I’ve been pretty good about washing the dishes regularly. No dishwasher. Thanks for the continuing series of organizing our homes. I clean my kitchen while cooking dinner. 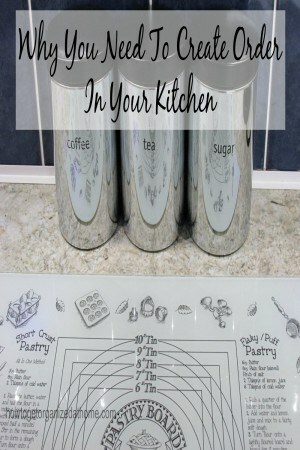 These are some great tips for keeping thr kitchen clean and tidy.